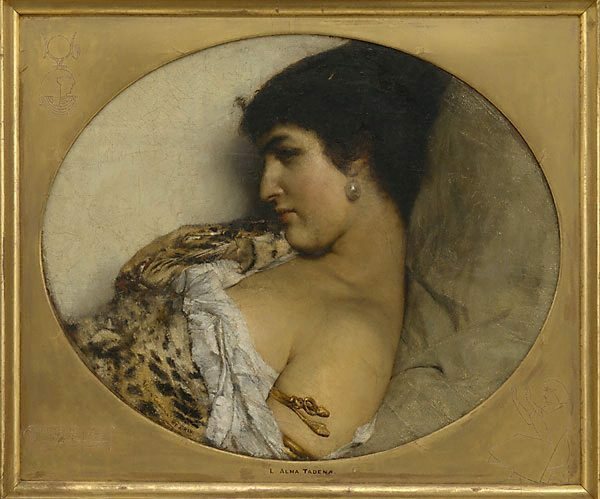 Signed and dated l.l., brown paint "L Alma-Tadema op CXLVI". Pilgeram and Lefevre, 1875-circa 1882, London/England, Commissioned by Pilgeram and Lefevre, sold circa 1882 to Sir Henry Thompson. Sir Henry Thompson, circa 1882-1904, London/England, Surgeon and pupil of Alma-Tadema. Father of Sir Herbert Thompson. Sir Herbert Thompson, 1904-1920, London/England, Gift of Sir Herbert Thompson 1920. An Egyptologist, Sir Thompson donated the painting to the AGNSW after members of his cousin's family (Mrs Montague Grover, Sydney) admired it. Atkinson J Beavington, Blackwood's Edinburgh Magazine , ‘Contemporary Art – Poetic and Positive: Rossetti and Tadema – Linnell and Lawson’, Edinburgh, Mar 1883, pp 392–411: p 403. Rudolf Dircks, Art Journal , ‘The Art Annual: the later works of Sir Lawrence Alma-Tadema’, London, Dec 1910, p 28. Georg Ebers, Westermanns Illustrierte Deutsche Monatschefte für das Gesamte Geistige Leben der Gegenwart , ‘Lourens Alma Tadema’, Germany, Oct 1885-Nov 1885, Oct 1885, pp 1–16, Nov 1885, pp 177–96: p 187. Renée Free, Art and Australia, vol 10, no 1 , 'European Collection', Sydney, Jul 1972, p 67, illus p 72. Jasper Griffin, The Australian Review of Books , 'Tales of the city', Sydney, Jul 1998, pp 25–26: p 25, col illus p 25. Alison Inglis, Queens & sirens: archaeology in 19th century art and design , 'The Past is not a Foreign Country', Geelong, 1998, pp 5, 9, no 2, illus p 9, fig 3. Wilfred Meynell, Magazine of Art , ‘Our living artists – Laurens Alma-Tadema, RA’, London, 1879, pp 193–97: p 197. Ursula Prunster., Orientalism – Delacroix to Klee , Catalogue entry, Sydney, 1997-1998, p 95, no 36, col illus p 95. The Art Annual: L Alma Tadema Royal Academician: his life and work , London, 1886, p 19. The exhibition of the Royal Scottish Academy of painting, sculpture and architecture, MDCCCLXXV, the forty-ninth , Edinburgh, 1875, p 19, no 224. Exposition générale des beaux-arts 1875: catalogue explicatif , Brussels, 1875, p 24, no 9. The exhibition of the Royal Academy of Arts … the one hundred and eighth , London, 1876, p 50, no 1282. The copy of this catalogue with interleaved illustrations in the Royal Academy library erroneously includes a print of the ‘Meeting of Anthony and Cleopatra’ of 1883 (Swanson, no 283). Academy notes, 1876 , London, 1876, p 65. Times , ‘Exhibition of the Royal Academy: first notice’, London, 29 Apr 1876, p 14. Athenaeum , ‘The Royal Academy (first notice)’, London, 29 Apr 1876, pp 600–03: p 603. Athenaeum , ‘The Royal Academy (third notice)’, London, 13 May 1876, pp 669–72: p 672. Illustrated London News , ‘Royal Academy exhibition’, London, 29 Apr 1876, pp 418–19: p 419. The Grosvenor Gallery: winter exhibition , London, 1882-1883, p 22, no 129. Fair Women , London, 1894, p 34, no 142. This is a small catalogue approx 8 inches square with 144 pp and no illustrations. Athenaeum , ‘The Grafton Galleries (second and concluding notice)’, London, 14 Jul 1894, pp 70–71: p 71. Sir Lawrence Alma-Tadema , London, 1902, p 70. As collection of Sir Henry Thompson. The Royal Academy of Arts: a complete dictionary of contributors and their work from its foundation in 1769 to 1904 , London, 1905-1906, vol 1, 1905, p 28. Spring exhibition , London, 1908, p 44, no 400. Forty-third autumn exhibition of modern art , Liverpool, 1913, p 53, no 1040. Exhibition of works by the late Sir Lawrence Alma-Tadema, RA, OM , London, 1913, p 20, no 47. Daily Telegraph , ‘New pictures at the Art Gallery’, Sydney, 26 Apr 1921, p 7. Sydney Morning Herald , ‘The Art Gallery: an Alma-Tadema portrait’, Sydney, 26 Apr 1921, p 7. Cléopâtre dans le miroir de l'art occidental , Geneva, 2004, col illus p 358, fig 1. Text reference in caption only. National Art Gallery of New South Wales (annual report of the trustees for the year 1921) , Sydney, 1922, p 2. Sir Lawrence Alma-Tadema: the painter of the Victorian vision of the ancient world , London, 1977, p 137. Listed as no CXLVI, Art Gallery of New South Wales, Melbourne (sic). Major literary characters: Cleopatra , New York, circa 1990, cover illus. The Royal Scottish Academy exhibitors, 1826–1990: a dictionary of artists and their work in the annual exhibitions of the Royal Scottish Academy , Wiltshire, 1991, vol 1, p 41. Sir Lawrence Alma-Tadema , Amsterdam, 1996-1997, p 91. Essay by Diane Sahko Macleod. Art Gallery of New South Wales annual report 1999 , Sydney, 1999, p 56. Loan. Pre-Raphaelites and Olympians, selected works of Victorian art from the John and Julie Schaeffer and the Art Gallery of New South Wales collections , Sydney, 2001, unnumbered, p 49, col illus p 49. Lawrence Alma-Tadema , London, 2001, pp 116, 169. The biography and catalogue raisonné of the paintings of Sir Lawrence Alma-Tadema , London, 1990, p 182, no 184, illus p 360. Some modern artists and their work , London, 1883, pp 92–93. British painters of the eighteenth and nineteenth centuries , London, circa 1880, p 139. National Art Gallery of NSW illustrated catalogue , Sydney, 1924, p 50, no 134. Sydney Mail , ‘Current topics: Cleopatra’, Sydney, 04 May 1921, p 6, illus p 6. Cleopatra's face: fatal beauty , London, 2001, p 49, col illus p 49. British painting 1800–1990 in Australian and New Zealand public collections , Sydney, 1997, p 44, no 20. Art Gallery of New South Wales catalogue of British paintings , Sydney, 1987, p 7, illus p 7. Famous people: a selective who's who from works in the Art Gallery of New South Wales , Sydney, 1981, p 3, illus p 3. Victorian Olympians , Sydney, 1975, pp 14–15, no 4, illus p 53. Sir Lawrence Alma-Tadema, OM, RA , London, 1905, pp 57, 73–74. Not pp 98–9 which refer to ‘his second study from life of Cleopatra’ meaning ‘Anthony and Cleopatra’.